Get a free mamechiyo coin purse when you take a picture with a mamechiyo girl standee at either KLCC, Pavilion, Mid Valley and One U! How to get the FREE mamechiyo coin purse? Take a picture with a mamechiyo girl standee at either Shu Uemura @ KLCC, Pavilion, Mid Valley or 1 Utama. Upload your picture from your mobile at the store, onto Shu Uemura fan page with the word "Kimono" in a sentence! 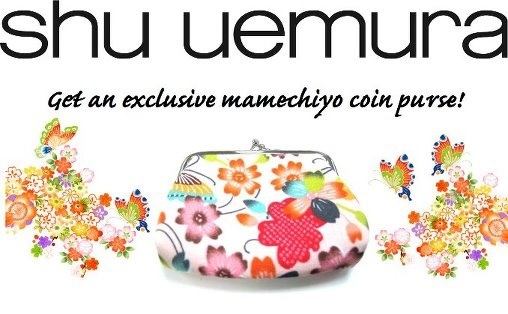 Show it to Shu Uemura staff and get a mamechiyo coin purse on the spot*! Offer ends 20th April while stocks last. One mamechiyo coin purse per fan only. Fans must post their picture onto Facebook from the store for immediate redemption.